And they’re doing so with a great giveaway! Just last month, we covered the initial release of the Gran Ton Rismo (also known as Crypton Racing) beta, where some of the basic features and mechanics of the game were explained. Today, we are introducing the next update (to be rolled out today, February 4th), which aims to bring a lot of strategy and planning into your gameplay experience. There’s also a special giveaway that is taking place right now, so hurry up and read! One important thing about the update we can’t shy away from is that, come the update, all of your Crypton’s age and their stats will be set back to zero. Apparently that’s a measure that had to be taken, but the developers promise this will never happen again. Let’s hope that they deliver on their promise, because resets like that is one of the biggest no-nos in online games, and is a surefire way to piss some people off. However, we’re still on the beta and these type of measures are expected to happen, so it’s not a big deal. Another thing that’s expected to happen in these stages is the implementation of new mechanics, as is the case now due to the introduction of the Legacy system. From now on, any of your Cryptons that are born from an age 10 or above Crypton will inherit a higher skill fire-rate and will also have Legacy. Legacy will boost your Crypton’s stats, even if they are already maxed out, which opens the possibility for strategy to play a much bigger role in the game. The way Legacy works is that your Crypton ages through racing, and now the effort you put throughout your racing history will determine the Legacy rewards that your Crypton will pass down to its offspring. What this essentially means is, the better you do in races, the more profitable Crypton offsprings you will breed. 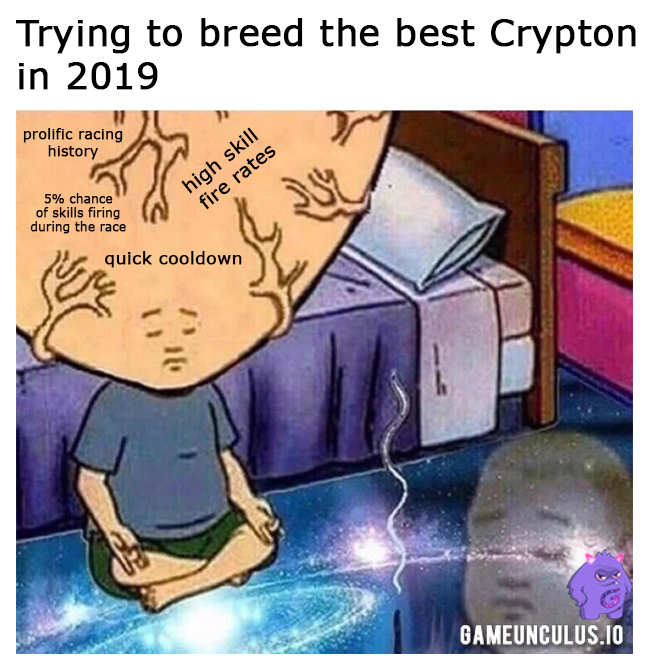 This inclusion of a high-risk high-reward system is accompanied by the addition of more casual races that will not age your Cryptons. This update fits casual players as much as it fits nerds who are in it for the metagame. This is not the only change that comes with the update. In addition to the Legacy feature, there will be multiple game modes such as the mastery and seasonal cups and special races where only a certain kind of Crypton can participate. Finally, they have also introduced Coinks, the in-game currency that will be used in the future. However, it has been confirmed that Coinks are not ERC-20 tokens. And, as a special way of celebrating this big update, there’s a giveaway! CryptOink partnered with Dapp.com for this occasion, and all you gotta is simply retweet this tweet to be elligible for one of six Special Limited Edition Crypton! You have until February 7th to retweet it, but you might as well do it right away. It’ll take you seconds! Do you see potential in these hard-working piggies? Has crypto gaming found its own Mario Kart? Leave your thoughts in our Twitter and Telegram and we’ll have a nice chat about it.